Posted 7/22/2018 3:20pm by Cheryl. It's hot, it's dry. 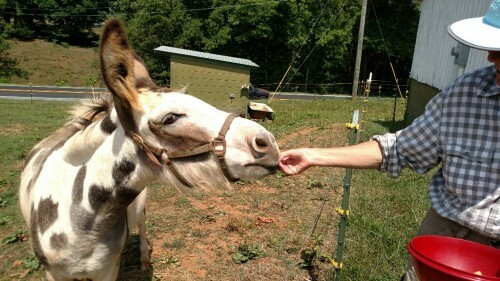 And even though a donkey is a desert animal, sometimes she just needs a refreshing treat. How about a nice cantaloupe rind, hmmm? Brix has earned her place in the pasture by demonstrating that she is Yam worthy. What's "Yam worthy," you ask? 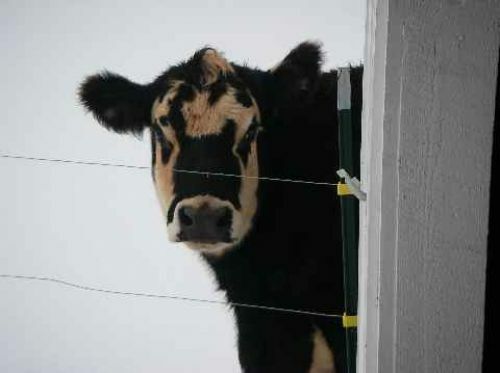 Yam was our cow -- but she was much more than a cow, she was The Greeting Committee for the Capella Community. She graced (and grazed) our pasture for 14 years. A very special cow. And she LOVED cantaloupe -- we call it Yam-aloupe. So now Brix has earned her Yam-aloupe merit badge. Lots of projects underway right now. It's that time of the year when we are both tending summer crops like peppers, tomatoes and okra while we are getting ready for fall crops. Lots of seeding is happening right now! 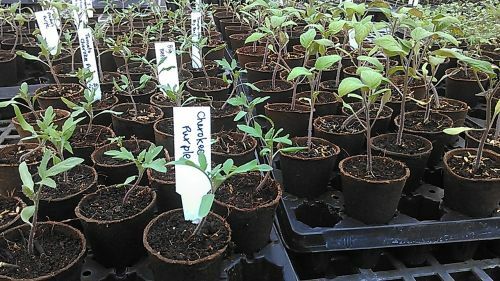 Kale, collards, broccoli, kohlrabi and lots more are hitting the seed trays. 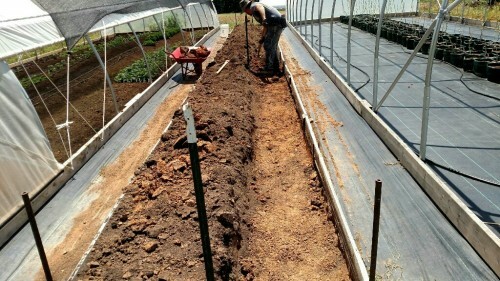 And we are also prepping beds for additional plantings. We built a raised bed last year between 2 of our high tunnels and have been growing carrots in them since then. We have been noticing some poor drainage and what looked like compaction with our last round of carrots. So we decided to remove about a foot of the soil and amend it with lots of composted leaves for our next planting which will be beets. We joked with Jonny and Chris that they were on the Chain Gang as they dug out wheelbarrow after wheelbarrow full of soil. 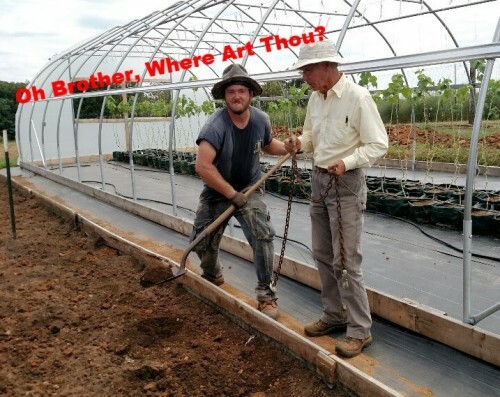 I think I heard them singing "A Man of Constant Sorrow".... We are glad these guys have a sense of humor! We got the rest of the potatoes harvested this week. A respectable harvest but not our biggest -- about 1500 pounds. 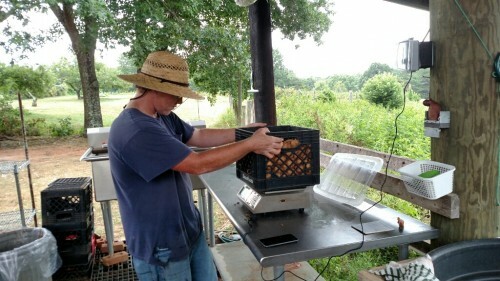 Unfortunately we had to harvest the fingerlings and Bintje earlier than usual because Late Blight hit the field. Once that happens, you need to get the tubers out as quickly as possible so that they don't become diseased. 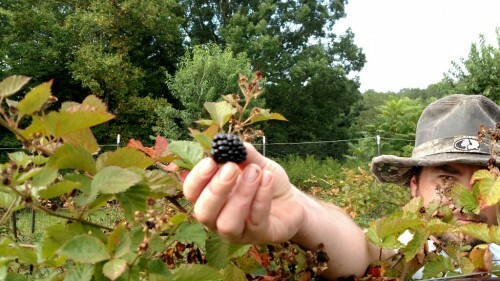 Well, we had hoped to do one more PYO event this season but it looks like the berries just won't be plentiful enough. 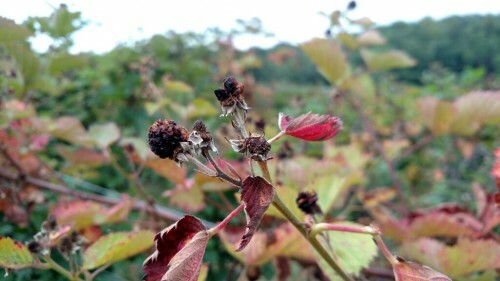 We had a great harvest earlier this week but now the berries are slowing down to a trickle. 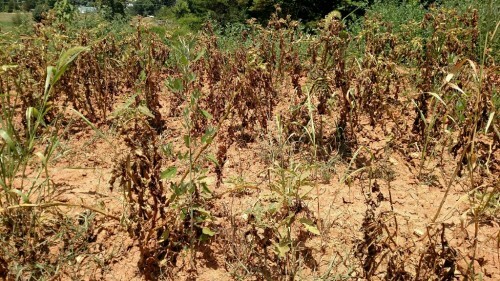 I am sure that the drought has had an impact -- even though we have been irrigating a lot. Always a sad time for a small fruit farmer -- seeing the end of a great crop. Come and get 'em while you can! 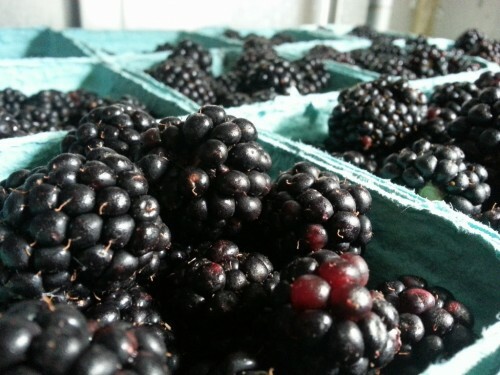 This will be the last week for our sweet blackberries at market so stop by and grab a pint! Saturday will be Ice Cream Day at Cobblestone so it sounds like a great match-up of flavors! The Potato Bar gets two new additions this week: Bintje (the original French Fry Potato) and the popular LaRatte Fingerling. We'll also have German Butterball, low-glycemic Nicola, and Huckleberry Gold. Boxes of the cute little Creamer Potatoes will also be available. We'll also have lots of other Certified Organic goodness including big beautiful heads of Escarole, Garlic Sampler Bags, freshly Cured Garlic (including Elephant, Red Toch, Music and Chesnok), the last of the Garlic Flowers, Carrots and some Pea Shoots. 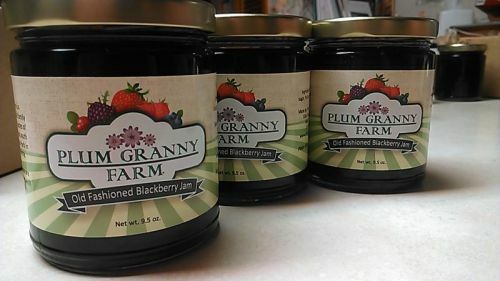 And we'll be bringing some of our tasty JAM to market too! That's all the news from the farm this week. 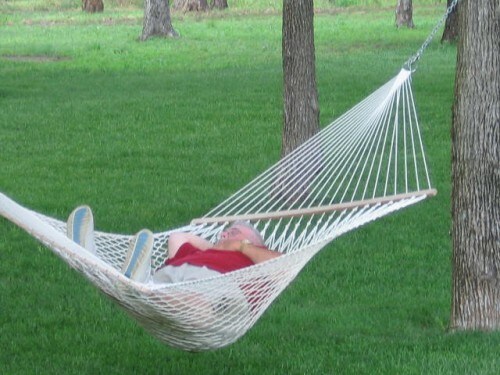 Don't forget to celebrate National Hammock Day on Sunday! A lazy July afternoon in the shade? I'll nap to that!